Normally, the albums that land on my desk for review, fall into one of two categories, either they are by artists I am already well aware of, or they are from artists that have fallen under my radar. 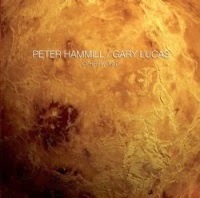 Other World, by Peter Hammill and Gary Lucas is the first to fall into a third category, being very aware of one artist, but not the other one. Peter Hammill has been around for a long time, both as a solo artist and as a member of Van Der Graaf Generator, and indeed I possess a copy of The Silent Corner and the Empty Stage, an early solo album and have used VDGG’s “Theme One” as intro/outro music to my radio show at one point. Gary Lucas, I have since discovered has been involved with many artists including Captain Beefheart and Jeff Buckley. I should perhaps say from the outset, that I am fascinated by the vocalisations that Peter Hammill produces, but am not a person that warmly embraces the more cacophonous side of VDGG and therefore I did approach this release with a little bit of apprehension. This is a collaboration between these two guitarists and the music on Other World, described by Peter Hammill as “something quite strange, but also strangely powerful,” features little more than guitars and Peter’s unique vocal style. At first glance, and listen, the pairing of Peter and Gary might lead one to think that the abrasive electric riffs associated with one guitarist would not sit well alongside the other guitarists more virtuoso styling which straddles the genres from the ambient to the more blues ridden. Nothing could be further from reality, as the music that they generate certainly piques the interest. Other World is a 14 track album with a total playing time around 59 minutes. The longest and shortest tracks on Other World are “Slippery Slope” and “Means to an End,” running for 7:04 minutes and 1:38 minutes respectively. Opening tracks to albums set the scene for the listener and can nudge them towards being either positive or negative and so the importance cannot be played down. “Spinning Coins” (2:55) draws the “short straw” on the album, but copes with the pressure admirably. The combination of superb acoustic guitar playing, the edgy unique vocals of Peter and the slightly discordant, almost ethereal, electric guitar behind both, just hits the spot. This is a majestic start which makes you eager to move further into the rest of the album. There are 5 instrumentals included on the album, Other World, and they are “Built from Scratch” (4:26), “Attar of Roses” (4:20), “Glass” (3:27), “Means to an End” (1:38) and “Slippery Slope” (7:05). They range from the dark and somber (Built from Scratch) through the gentle, atmospheric acoustic (Attar of Roses) and onto soundscape, ethereal and cinematic (Glass and Slippery Slope). The other tracks on the album fit into the straightforward “normal” sounds (i e no noise or discord) of “Kith and Kin” (5:30). “This is Showbiz” (3:05) and “The Kid” (4:17) as well as those that utilize passages of noise and discord. This latter group would include “Reboot” (6:56), “Black Ice” (4:59) and “Means to an End” (1:38) which seem based around discord or weave into discord and then out again. Other World is certainly a difficult album to get into, even with repeated plays. I find a lot of what is on offer to be grouped with the best music I have heard thus far in 2014, but find I cannot appreciate the album when the artists meander off into the “land of discord.” At the outset I did mention that some of the more cacophonous passages which regularly litter VDGG music, I just don’t like, and I find the same with Other World. To use a soccer cliché, this album is like a “game of two halves” and I find the amazing music on offer, to be overshadowed by the more discordant and as such, it isn’t an album I will return to often. This of course is a personal opinion as always, and I would encourage people to give this album a few listens and make up their own minds.